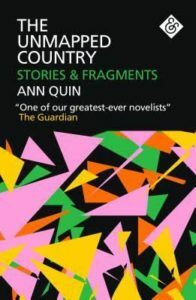 That The Unmapped Country, a selection of “stories and fragments” by the English writer Ann Quin not previously published in book form, is likely to give this writer a higher profile than she has until now enjoyed will unquestionably make its publication a worthwhile effort. Especially since postwar British experimental fiction is not exactly a celebrated phenomenon — many might express surprise that it is even a “thing” at all — to remind readers and critics that not only was Ann Quin during the 1960s and 1970s an avowedly experimental writer but that she was also, as Jennifer Hodgson points out in her editor’s introduction, part of a contingent of British writers defying conventional practice that also included B.S. Johnson, Christine Brooke-Rose, Brigid Brophy, and others, surely provides a literary service, both to current readers previously unacquainted with either Quin or the movement to which she belonged, and to the legacy of these writers as it informs our understanding of postwar British literary history. Whether this book enhances or alters Ann Quin’s pre-existing reputation as a writer of unconventional, adventurous fiction is not as conclusive. The book is a miscellany, including works of nonfiction and collaborative prose pieces, rather than a collection of short fiction per se, and while several of the stories that are included evoke subjects and strategies found in Quin’s novels (one was later transformed into a novel), readers unfamiliar with the novels will probably find them less compelling absent the context of their specific associations with the phases of Quin’s all-too-brief career, which ended with the writer’s suicide less than 10 years after the publication of her first novel, Berg. Unfortunately, the book doesn’t provide much editorial guidance that could help us place the included short works in such context (although this omission was most likely prompted by the publisher, lest the book become too “academic”), and thus to a large extent we are left with a series of discrete prose works that vary enough in tone and approach to make their chronological presentation seem more haphazard than sequential, the reader’s experience of the collection as a whole oddly disconnected, without some broader perspective on the writer’s assumptions and ambitions. Jennifer Hodgson in her introduction does offer a useful signpost to Quin’s characteristic thematic emphasis when she observes that “Quin is often drawn to experiences of difference, extremity, and disorientation,” but this doesn’t finally encompass the way in which the extreme and disorienting experiences are represented in Quin’s fiction, which are as stylistically and formally extreme as the situations themselves. Berg is perhaps the most conventional of her four published novels, which is not to say that ultimately it is very conventional, as both its language and its use of point of view require an especially attentive reader to appreciate their more subtle effects. Indeed, a reader expecting the familiar expository and narrative devices found in most novels — even the most “serious” — would no doubt be disoriented by the general disregard in Quin’s work for not just conventional character or plot development, but the usual rules of consistency and continuity, the discursive rules that produce transparent prose, clearly delineated sequences of events or activities, as well as lines of dialogue clearly demarcated among the characters. Three, the immediate successor to Berg, coheres as an account of a failing marriage during and after the married couple’s encounter with a third woman, who lives with the couple for a time before she ultimately commits suicide. But the story is told in an oblique way through alternating sections that focus on the couple in the present attempting to cope with the aftermath of the younger woman’s death (and of their experience during her stay), and that present selections from the woman’s diary, as well as tape recordings she left behind. Quin provides no expository passages allowing us to locate the story in its full context, and we are obliged to assimilate it in the sheer immediacy of its presentation. Passages does something similar, but in this third novel the connections are even more elusive, the ostensibly underlying story — a woman and man traveling in an unnamed Mediterranean country while the woman looks for her missing brother — even more opaque, although no doubt deliberately so. But the substance of Ann Quin’s novels are not to be found in their stories but in the ways in which Quin displaces the story without ever quite abandoning it, in favor of patterned language, abrupt juxtapositions, and a fluid treatment of perspective and point of view. These qualities are perhaps most conspicuously evident in Quin’s final novel, Tripticks. Although ostensibly the story of a man being followed by an ex-wife and her new lover, the situation is otherwise the pretext for a phantasmagoric collage of surreal imagery, freely associated memories, and brief narrative episodes relating not so much the protagonist’s life as his hallucinatory perception of it. Presented as a first-person narrative, the novel uses the narrator’s point of view as a way of transgressing the boundaries imposed by the conventional novel while also giving this novel a more recognizable unity—the dislocations of plot, setting, and character (at times the characters almost seem to blend into each other) can be integrated as the metaphorical expression of the narrator’s experience of his life. Paradoxically, what at first seems Quin’s most radically disjunctive work may be her most cogent, and it inevitably as well prompts us to consider the extent to which it might also be the metaphorical representation of the author’s own increasingly displaced mental state. In this way, Tripticks may be her most audacious novel, even if it could also be described as in part a recognizable sort of satire (it is Quin’s most explicitly comic work) lampooning modern American culture (the novel is based on Quin’s experience in the United States after winning a writing fellowship). But the absurdities of life in America are staged in what critic Philip Stevick in his essay on Quin’s work calls her invocation of the “theater of mind,” and in Tripticks the performance is especially frenetic, freed of inhibiting restraint. The novel’s underlying formal organization as a kind of road novel allows it to retain a fundamental coherence, however. Quin is able to summon the surreal imagery and fracture the perspective and chronology yet still maintain an inherent aesthetic unity, something that she seemed less concerned to pursue in her previous novels, where collage and fragmentation were adequate formal devices in themselves. Perhaps because we cannot exactly know what Quin might have subsequently done to further extend her aesthetic reach, it is tempting to read The Unmapped Country in order to identify tendencies that might have been pursued into new forms or subjects. Unfortunately, the book doesn’t really offer many clues. “Tripticks” is the story that served as the seed for the subsequent novel, but the other stories published at around the same time finally seem relatively uninspired. “Never Trust a Man Who Bathes with His Fingernails” is composed in free verse, but the story it tells is a familiar enough (for Quin) study of tangled relationships and doesn’t really justify the formal device. ”Eyes that Watch Behind the Wind” is reminiscent of Passages in its focus on a couple traveling in a foreign country (Mexico). “Motherlogue” is a one-sided telephone conversation providing the mother’s side of a dialogue with her daughter that ultimately proves rather slight. Of these completed stories, only “Ghostworn” seems to share with Tripticks and Quin’s unfinished novel the shift to a more direct enactment of the manifestations of mental disorder. In this story, a woman engages in dialogue with the ghostly presence of her dead lover, apparently emanating from the container of his ashes in her possession. The story does not explicitly suggest the woman is hallucinating, but of course it is tempting to think the author could be drawing on an experience of this phenomenon. In “The Unmapped Country,” the extant fragment of the novel Quin was working on at the time of her death, mental illness has apparently become the explicit subject. The first section of the novel follows “Sandra” through her day in a mental hospital. Paradoxically perhaps, this scene taking mental instability as its directly represented theme is the most conventionally rendered work Quin produced. A more or less traditional third-person narrator recounts Sandra’s interactions with the staff and her fellow patients at the hospital. A second section flashes back to a previous period in Sandra’s life, in this case narrated by Sandra herself. Presumably this alternation would have continued in the rest of the novel, although of course we cannot know for sure. It is equally inconclusive just how satisfying this more formally familiar approach might have proven to be. Certainly this fragment promises more implicit drama and immediate character identification than we find in the published novels (save perhaps for Berg). This might have made the completed work more “readerly” in the conventional sense, but whether that would have been taken as a necessary step for Quin or a betrayal of the experimental purity of the post-Berg novels is no doubt an inescapable if now mostly superfluous question.